Former First lady Dr Christine Kaseba has been appointed as Zambia’s new Ambassador to France by President Edgar Lungu. Dr. Kaseba will take over from Ambassador Humphrey Chibanda who was recalled in January,2018. During the swearing in ceremony at State House, President Edgar Lungu congratulated Dr Kaseba for the appointment. “May I congratulate you on your appointment as ambassador extra-ordinary and plenipotentiary of the Republic of Zambia to the Republic of France. You have vast experience as a health practitioner for over 30 years; you have worked as a consultant as well as lecturer. 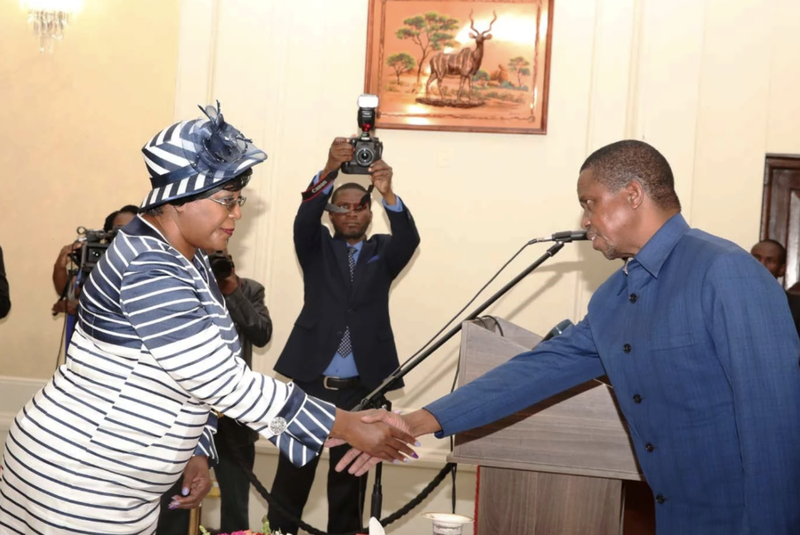 Your skills have seen you do a lot of work for the United Nations and other agencies in Zambia and abroad,” President Lungu said. “Zambia has a lot to benefit from France in various areas of human endeavour. I have no doubt that you are the right person to facilitate this and further enhance the bilateral relations between Zambia and France,” said President Lungu. And President Lungu has appointed Mr Gabriel Munshya as Public Policy Specialist in the Policy Analysis and Coordination division at Cabinet Office. “You will join a team a team which is responsible for coordinating the policy process aimed at enhancing government’s capacity to design and implement policies for sustainable and inclusive development. I am aware that you have risen through the ranks in the civil service having joined in 1988 as a detective Constance in the Zambia Police where, prior to your training, you attested and and solemnly pledged to be faithful, loyal and defend the Zambian Constitution. As such, considering the sensitivity of the position you have been appointed to, I urge you to take this oath very seriously, President Lungu said.